This was a small family bathroom at a house in St Albans with white ceramic glazed tiles and what was once white grout. The grout was now stained and proving difficult to keep clean, additionally the silicone seal between the tile and the bathtub was perishing. The bathroom needed cleaning and restoring to give it a new lease of life as well as making it easier to maintain for the busy family. Were actually based in St Albans so always a pleasure to pop round and meet fellow residents. The city dates to the Romans when it was known as Verulamium and these days its popular with commuters working in London. On arrival I inspected the tiles around the bath and could see they were going to be problematic, the silicone sealant was starting to perish, and I was concerned that the bottom row may be not be watertight. I like to do a job right the first time round so I decided the best thing to do would be to remove the row around the bathroom edge, clean them up and refit them with fresh adhesive, grout and reseal with silicone. With that in mind my first job was to give the ceramic tile and grout a deep clean by spaying on Tile Doctor Aqua-Pro and then scrubbing it in with polypropylene brushes and pads. This product is designed for the regular cleaning of bathroom tiles as is Tile Doctor Duo-Clean which is a stronger product that can tackle mould as well. The tile and grout were then given a high-pressure steam clean using a special machine we usually use on floor tiles and then let to dry off over lunch. After lunch the old silicone was stripped off between the bathtub and wall tile and this was followed by the careful removal of the bottom row of ceramic tiles. This is done by removing the grout first with an oscillating hand tool and then carefully prising the tiles off the wall without damaging them. The old adhesive was then scrapped off the exposed area to prepare the wall for re-tiling and the tiles were re-installed with fresh. Once the adhesive and gone off the tiles were re-grouted and the grout left to dry before applying a fresh silicone sealant between the tile and bathtub. During the various drying phases, the ceramic bathroom tiles were buffed using a soft white buffing pad to give them an as new appearance. 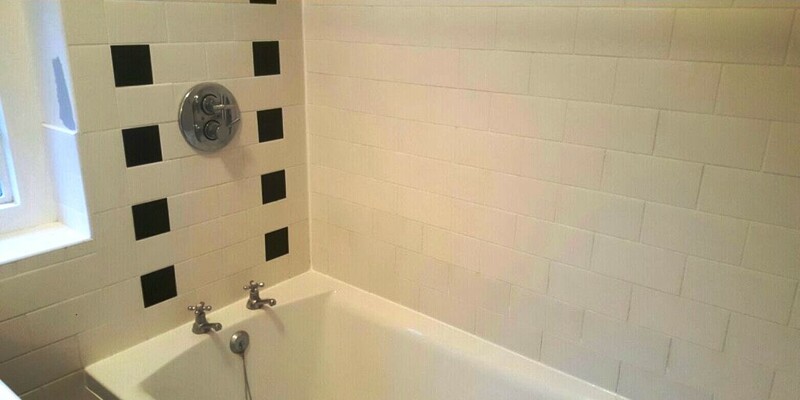 The job was completed in one day and the bathroom now looks like it was recently installed. 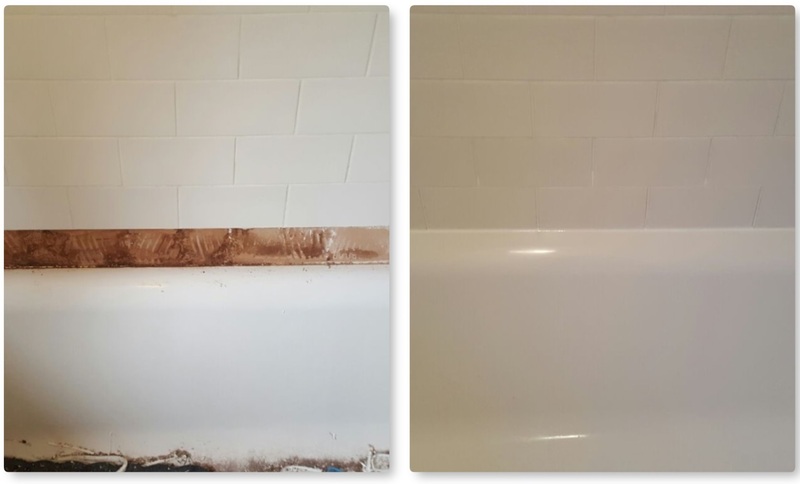 This entry was posted in bathroom, bathtub, Ceramic Tile, Cleaning, Grout Cleaning, hertfordshire, Mould, Shower, silicone replacement, st albans, Tile Cleaning Activities, Work History by TileProf. Bookmark the permalink.